Located on the ground floor, the main central room of the newly opened Соёнбот oрон temple in the Delgeruun Choira cultural precinct in Dungovi Aimag (Mongolia) is replete with elaborate detail and fine features. 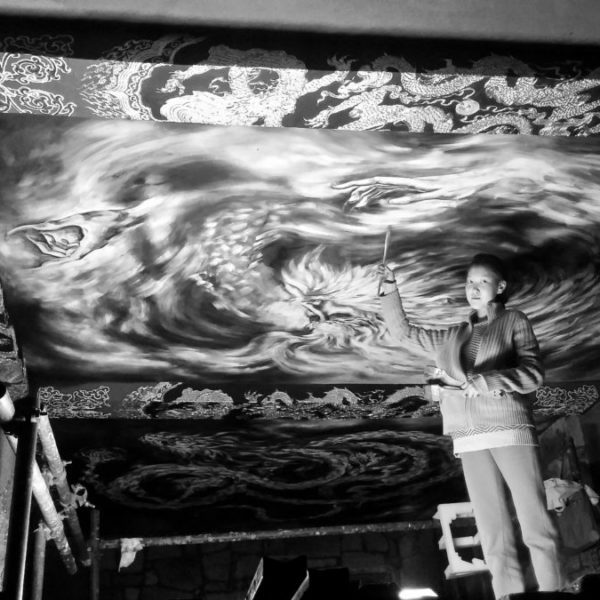 In close consultation with Zava Damdin Rinpoche, Mongolian artist Sukhbaatar Gantsatstral and her three artists-in-training children B.Enerel, B. Dulguun and B. Saruula are responsible for the beautiful artwork on the ceiling of this vast and imposing room. 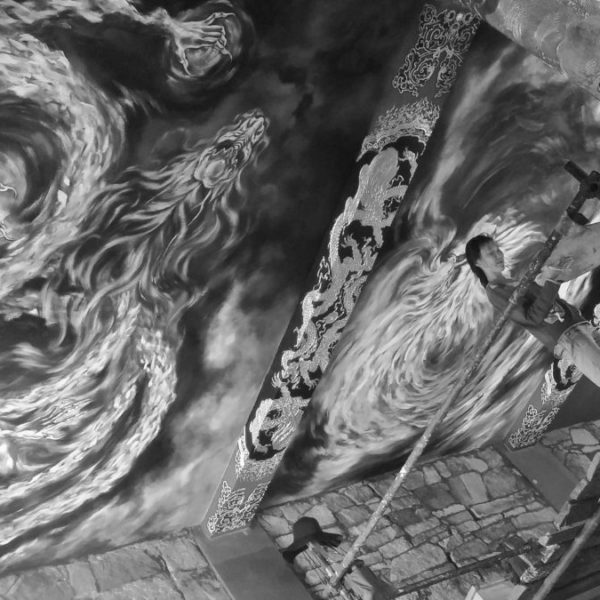 These paintings are contemporary interpretations and feature the five-clawed dragon, one of Zava Damdin Bagsh’s favoured motifs; one that is repeated on other surfaces throughout this central temple room. 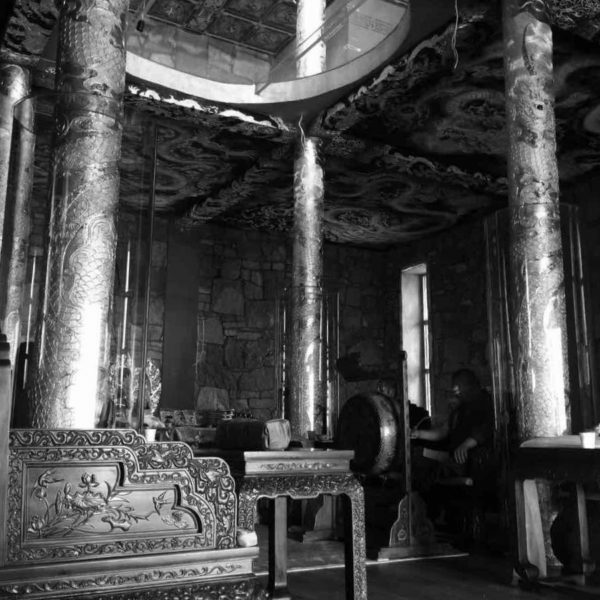 Note: 'Artscape 06: Соёнбот oрон central temple room' is the third in a series of four posts about the official opening of the new temple (Соёнбот ордон) in August 2017 at Delgeruun Choira Monastery in the Gobi Desert in Mongolia. 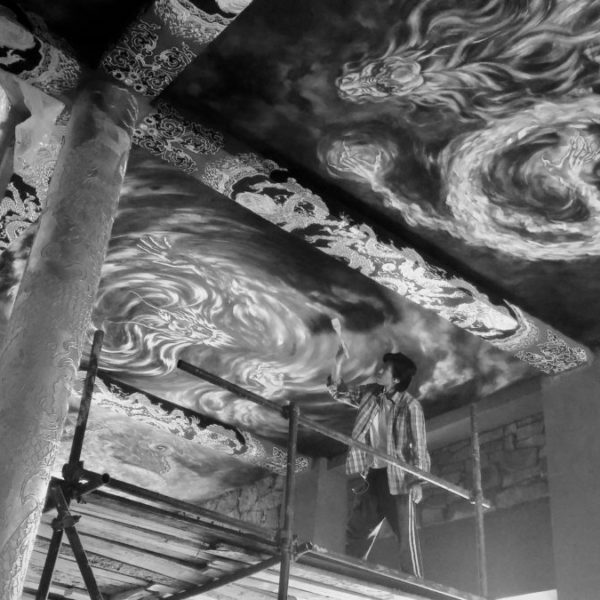 I wish to thank the Mongolian artist S. Gantsatstral for making available the visual resources for this post. Prepared by C.Pleteshner, Research Fellow, Nomadic and Buddhist Philosophies for The Zava Damdin Institute of Mongolia. © 2013-2018 CP in Mongolia. This post is licensed under the Creative Commons Attribution 4.0 International License. Documents linked from this page may be subject to other restrictions. Posted: 26 August 2017. Last updated: 10 February 2018. This entry was posted in Artscapes and tagged contemporary mongol culture, delgeruun choira, Gobi Desert, Mongolia, Mongolian Gelugpa Buddhism, Sukhbaatar Gantsatstral, zava damdin on August 27, 2017 by cp.